Musical eclectic, singer, old-time banjo great, public radio host, music teacher, bluegrass rhythm guitarist, storyteller, banjo museum curator, barber of Rural Retreat, Virginia, Jim Lloyd puts his mountain guitar expertise front and center on Play Guitar in 7 Days. From the jazz standard, “St. James Infirmary,” to traditional tunes like “Darlin’ Cory” and “Forked Deer,” to humor (“Uncle Hiram’s Homemade Beer”), gospel (“Must Come in at the Door”), and even the 1960s pop hit “Little Red Riding Hood,” Jim suggests the breadth of his interests. 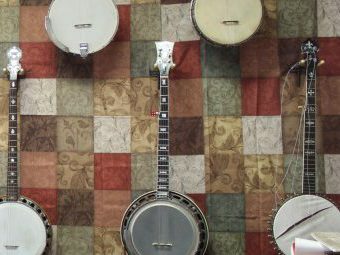 Solo, accompanying banjo genius Carl Johnson, and in string bands such as the acclaimed Konnarock Critters, Lloyd has established himself as a towering figure in Appalachian music today. Play Guitar in 7 Days demonstrates that the one thing he has not done enough of is recording solo projects.